Between a multiple choice test and an essay exam, most of us would rather choose the former. Multiple choice tests trick our brains that they’re easier to answer. All we have to do is to distinguish the correct answer from the distracters. 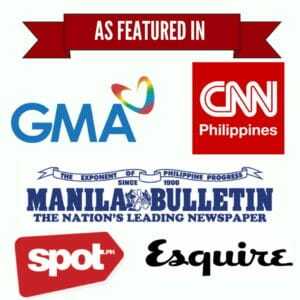 However, answering multiple choice exams are not as easy or straightforward as we like them to be, especially if we’re dealing with crucial exams like UPCAT or the Philippine civil service examination. The following tips are a perfect supplement to your hard-earned stocked knowledge and can maximize your success in answering any multiple-choice exam. Be wary of tricks and traps. Draw diagrams and pictures to solve tricky Math problems. Keep an eye out on negatives. Be systematic when faced with confusing questions/choices. Sometimes they’re easy to identify but the more subtle ones are what you should watch out for. Don’t overanalyze but never trust questions that are too easy either. Explanation: Parallel structures are used to ensure clarity of statements. According to this principle, words and phrases in a sentence should be consistent in terms of structure and tense. The example sentence above violates the rule of parallel structures. The first two verbs–play and eat–are in present tense, while the last one–sleeping–is a verb that acts as a noun, otherwise known as a gerund. b. Insertion of distracting phrase or clause that clouds subject-verb agreement. Explanation: Always focus on two things: the subject and the verb. Everything else is secondary. In the above example, the subject is “politicians” which is in plural form so the verb must also be plural. c. Use of inverted sentence structure. Explanation: Inverted sentences have verbs that come before the subjects instead of the other way around. It’s easy to assume there’s nothing wrong with this sentence if you don’t look closely. Explanation: Modifiers are words that add details or change the meaning of another word. To avoid confusion, the modifiers should be placed close to the subject being described. 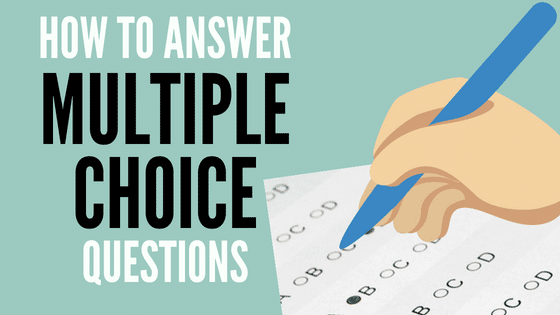 Most multiple choice questions provide you with four possible answers to choose from–A, B, C, or D.
Use the process of elimination to whittle down the choices to only two. If you remove the distracters from the equation, it will be easier for you to get to the right answer since you’ll only be choosing between two options. Dealing with only two choices also means you have 50% probability of getting it right. A qualifier is a word that enhances or limits the meaning of another word. Qualifiers can either be absolute (e.g., all, always, absolutely, never, certainly, best, every, only, worst, invariably, without exception) or conditional (e.g., usually, probably, possibly, seldom, might, much, most, often, generally, frequently). When you see a qualifier in one of the choices, it can either make the option correct or incorrect. In multiple choice exams, options that use absolute qualifiers are mostly wrong while those with conditional qualifiers like “often,” “seldom,” and “probably” tend to be the correct answers. Although some math problems can easily be solved with mental calculations, there are complex questions that warrant more visualization. By converting word problems into diagrams or pictures, you can make them less intimidating and easier to solve. 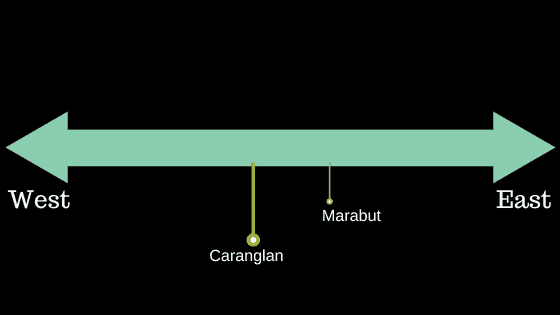 Next, place the other towns in their correct order as indicated in the word problem. 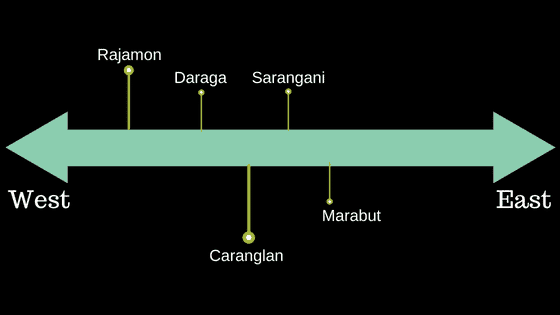 Based on the diagram we’ve created, we can easily see that the town farthest west is Rajamon. Although you can also visualize the diagram in your mind, actually drawing it on your scratch paper makes you less likely to commit mistakes. Negative words like none, never, not, no, and those with prefixes like un-, il-, or im- can change the meaning of a sentence. If you don’t read carefully, you may misinterpret a statement containing negative words as false when it’s actually true. The first statement, which contains no negatives, is true. The second sentence, on the other hand, has double negatives. When two negative words are present, the statement is also true since the negatives negate each other. Both statements above are true but the second one is relatively harder to figure out due to the presence of the negative words. When dealing with sentences like this in multiple-choice exams, identify the negatives first and then understand the meaning of the statement without the negative words. This way, you can find out whether the sentence is true or false without being influenced by the negatives. Multiple choice questions can be asked in different ways but regardless of the format, they all follow basic grammar rules. In some language proficiency exams, the answer can be the one that makes the most sense grammatically. For example, in a question that ends with the indefinite article “an,” the answer is most likely the one that starts with a vowel. Based on grammar rules, we can eliminate choices (a) and (d). You can now choose between options (b) and (c) since they’re the only ones that don’t interrupt the flow of the sentence and follow the basic subject-verb agreement. Grammatical clues can also be used to answer questions that test your ability to organize phrases or sentences. a. Secondly, they had no leader. b. Firstly, the workers were not united. c. Finally, they did not have the support of their families. d. Thirdly, they had no funds to tide them over. e. From the beginning, it looked like the worker’s strike was doomed to fail. However, the probability of getting the question right if you choose this letter is similar to your chances of winning the lottery. Don’t look for patterns in places that have none, especially in multiple-choice exams where answers are arranged in random order. Therefore, if you notice that you’ve chosen the same letter for three consecutive questions, don’t be alarmed. The pattern must be coincidental so never let it interrupt you from answering the rest of the exam. The goal of the test maker is not to make your life easier. But no matter how long and confusing the questions and their corresponding choices may be, you can arrive at the right answer by taking it one step at a time. Which of the following facilitates the healing process? Resting the injured part of the body. Protection of the wound from further Injury. Emotional support from friends and family. Depriving the patient of fluids. At first glance, the question may look overwhelming. But by being systematic, you can easily spot the answer without wasting so much time. First, eliminate the statement that is apparently false, in this case (e) or “Depriving the patient with fluids.” Next, go through the choices and eliminate those that contain the false statement (e). By doing this, you can trim down your choices and have a better chance of picking the correct answer. Frequently check that your answers match the corresponding questions, especially after you have skipped some items. Hide or cover the choices when reading the stem or the body of the question. Figure out the answer if you can so you won’t be distracted by the other choices by the time you uncover them. Write down as many formulas as you can remember on the scratch paper provided as soon as the exam starts. You can either do this at the beginning (at the risk of losing a few minutes) or after finishing the first part of the exam, provided that it doesn’t require computations like Language Proficiency. If you have remaining time left, go over your test paper for the very last time to change answers for questions that you’ve either misread or just finally realized the answers to. Also, check for errors like stray pencil marks, question-answer mismatch, and shading two answers for the same question.